Daily departures with several times to choose from; for the sunset tour, depart at 4pm, 5pm, or 6pm. 5pm or 6pm departure to ensure you see sunset – Check before you book what time sunset will be when you visit. We are comparing Venice Sunset Boat Tour Prices from leading ticket suppliers and Try to find you Cheap tickets prices on the market. The typical boat you board will either be a sampierotta (traditional fishing boat) which seats up to 4 or a bragozzo (two-masted trawler) which seats up to 11 passengers. No matter which one you have you\'ll be able to enjoy the panoramic views of this stunning UNESCO World Heritage City. Cruise across the water toward the island of Sant\'Andrea and admire its 16th century fortress as well as the views of St Mark\'s Basilica behind you. You\'ll then travel across to Lido, the 6.8 mile (11km) long sandbar that sits between the Venetian Lagoon and the Adriatic Sea. Next, you\'ll pass by the remote islands of San Lazzaro degli Armeni, San Servolo, San Clemente, Le Grazie and then back towards Giudecca, and San Giorgio Maggiore where you can admire the light hitting the Salute Church and again, view the stunning scene that is St Mark’s from the water. An idyllic way to admire Venice. Good for couples and friends looking for an enjoyable time out on the water. A great way to see more of Venice – Visiting islands that other touristic tours rarely go to. Not good if you\'re seeking a private romantic evening on the water as this is a group tour of up to 11 people. This boat tour only travels around the Venetian Lagoon – It does not travel up the Grand Canal. Your Experience With Venice Sunset Boat Tour? Make your way to the meeting point and board your typical Venetian boat where your friendly local skipper/guide is waiting to take you on a very memorable ride through the lagoon. You will travel through St Mark\'s Basin, being able to admire the light catching the architecture in St Mark\'s Square, and along the Venetian Lido, passing some of the area’s idyllic islands including Sant\'Andrea, San Lazzaro degli Armeni, San Servolo, San Clemente, Le Grazie, Giudecca, and San Giorgio Maggiore. During the 2 hour ride your skipper will stop the boat and you\'ll be able to drift on the water admiring the various hues of the sunset as you sip on a chilled glass of Prosecco. Afterwards you\'ll make your way back into the centre of Venice via St Elena and Arsenale. just as the city lights are being turned on, depending on the time of your booking and time of season. The tour ends at the original departure point. 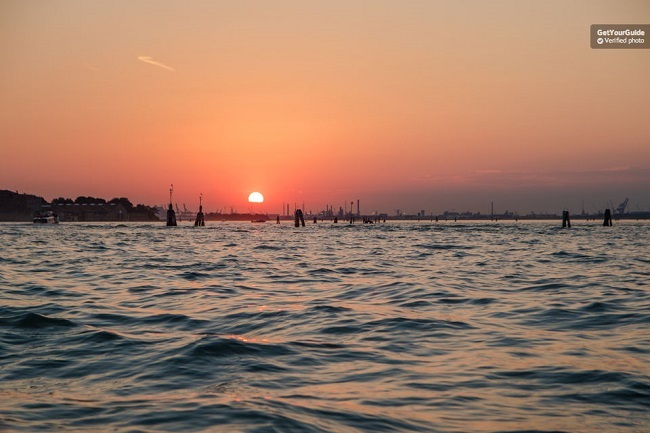 What Venice Sunset Boat Tour Includes? Book the right time slot – If you depart too early you\'ll miss sunset entirely. Lay off the drink if you have a weak bladder, there are no toilet stops! Travelers Reviews about Venice Sunset Boat Tour? Travellers talking about this sunset boat tour on GetYourGuide, Viator, and TripAdvisor only have good things to say about it, it receiving the highest ratings and really good, positive reviews. People say that Tomasso is the friendliest skipper, sharing stories of the history of Venice in an engaging, humorous way and also handing out local travel advice on what to see and do. This tour is highly recommended, everyone agrees that this is a tour they would go again. Paper tickets and e-tickets are accepted. There is a possibility of cancellation after confirmation if there are not enough passengers to meet requirements – Check your email before going to the departure point. If you would prefer a soft drink, notify the booking operator before travel. Departs from the \'Ospedale\' vaporetto stop.